LONDON – The lights were bright on the curtains. It was the hush before the start of the play, the moment when the audience and the star alike breathe in, stomachs tightened. The cameramen at their tripods leaned forward to check the focus. The curtains parted, and there he was: blonde hair, his pallor accentuated by the harshness of the lights, the world’s biggest cyber-activist. For one night only: the Julian Assange show. “Good evening, London,” he said in his cultured-Australian accent, standing on a tiny semi-circular balcony with all the assurance of a star performing in the West End’s finest theater. It was Dec. 20, and the WikiLeaks founder’s appearance marked six months since his auto-incarceration in London’s Ecuadorean embassy. Although Assange was within inches of British police tasked with detaining him, the balcony on which he stood is, owing to the vagaries of international law, Ecuadorian territory. Thus, he could do what he pleased—namely, to speak at great length about perceived injustices. Sweden wants to try Assange on sexual assault charges, and Britain has promised to arrest him if he steps foot on London pavement. Ecuador has granted him asylum—and a room in which to live. Assange says Sweden only wants to detain him so as to hand him over to the United States, which is angry that his WikiLeaks organization released millions of classified American documents. U.S. officials deny such a “secret warrant” exists, and Swedish officials say they just want to see justice done. His speech was classic Assange, but nothing we hadn’t heard before. He began with his own plight, his 185 days in the embassy, and he thanked his supporters for holding vigils for him. A documentary crew off to my left had brought a loudhailer and tried to ask him questions. He, apart from a slight tilt of his chin, ignored them and continued his soliloquy, moving from himself to the plight of the world. “Our buildings can only be as tall as their bricks are strong. And our civilization is only as strong as its ideas are true,” he intoned, periodically earning cheers and cries from the 100 or so supporters present. There was a time when he cooperated closely with the Guardian, the left-liberal British newspaper that published many of the leaked diplomatic cables. Now, relations have broken down irreparably, and a Guardian interviewer referred to him this month as looking like an “in-patient” and as “someone convalescing from a breakdown.” The interview was about Assange’s new book, Cypherpunks, but spent as much time questioning his sanity. Standing next to me on Thursday was Luke Harding, Guardian correspondent and co-author of the book on which a forthcoming Dreamworks movie about Assange is based. In an entertaining subterfuge, he felt obliged to hide his identity from the people around us, who instead focused their ire on me. “The New Republic? What’s your editorial line on Assange then?” snapped an east London girl with a V for Vendetta mask pushed to the top of her head. Assange continued to speak, fluently, in a voice affectingly weak after his months inside. When he finished, he raised a clenched fist and was gone. The crowd pleaded for an encore. A Spanish-language chant rose: “The people are with you.” But the show was over, the curtains were closed, and the news crews packed up their tripods. All in all, it had gone as scripted. And, in fact, the people around me seemed straight out of central casting: the protesters with their dreadlocks; the fur-clad West London lady telling Assange’s acolytes, “I don’t think it’s very polite of you to stand on my doorstep”; the greasy-haired roadie in a black t-shirt checking Assange’s microphone. Walking away from the Ecuadorean embassy, past the enormous Harrods department store, I had that uncanny feeling of leaving a matinee, when you suddenly realize you have been inhabiting a different world to the rest of the city. ASSANGE’S SUPPORTERS STILL REFUSE to countenance anything bad about their hero. According to them, anyone who says he is impossible to work with are part of a plot. The women in Sweden who accuse him of sexual assault are CIA provocateurs. And anyone who argues for the Swedish courts’ right to try Assange is an enemy. But the greatest threat to Assange is himself. He’s in danger of becoming just a character in a reality show, with nothing more to say than any other celebrity turn in the city’s theaters. His turbulent private life has so overshadowed his cause that it is now all but impossible to separate them. Even WikiLeaks is a shell of its former self, as former allies have given up on it and launched their own projects. After Assange’s appearance, Harding and I bought tea and mince pies in a café on Knightsbridge, where he reminisced about the days when he could pop in on Assange for a chat. “If Scotland Yard really wanted to drive him out of there, they would just have to turn off the internet. It doesn’t really matter to Julian whether he’s in Iceland or wherever, as long as he’s got the internet,” he said, as he played with a scrap of piecrust. In other words, how long will it be before editors no longer green-light articles like this one? 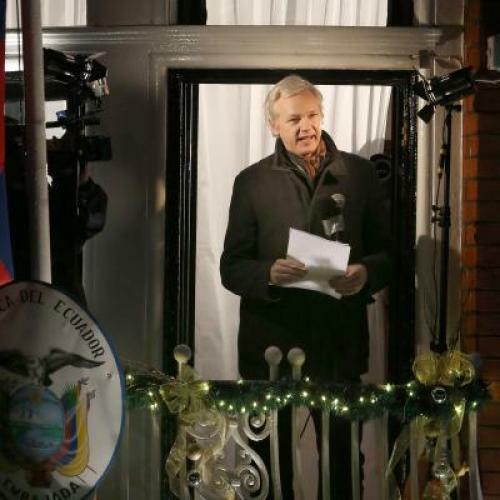 Will it be Assange’s one-year anniversary at the Ecuadorian Embassy? His two-year anniversary? Eventually, no one but his fiercest supporters will mark these occasions, and Assange himself will have to write a new script if he wants people to keep buying tickets to the show.